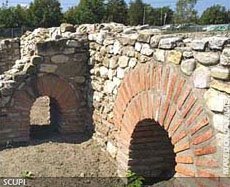 Scupi, town from late ancient and roman period is located in north-western part of Skopje near Zajčev Rid, the village Zlokukjani and the river Lepenec. The establishment of Scupi is connected with the roman entering in Dardania at the end of the 1st century BC. Scupi was founded as a Roman military camp. As the time goes the war camp became a town with a status of colony. The establishment of Colony Flavia Scupi made the king Dominian (84-85 year). The citizens lived all over Skopsko Pole, for which there are epigraphic confirms. The Romans located Scupi by important magistral roads that connected the Aegean Sea with central Europe, Thrace with the Adriatic coast. Scupi had wonderful geographical position. In the year of 286-296, the powerful Gothic and Herullian forces crossed this area. By forming the province of Dardania at the end of 3th century Scupi becomes seat of province authority. In the year 379-388 in Scupi stayed the king Teodosius and Scupi became an episcopacy seat. In the end of the 4th century is noted a big war formation. In the year of 447 Scupi suffered from the war routes of the Hunes. And in year of 518 there was the biggest disaster, and earthquake. After this earthquake Scupi became a rural place for living. The urban style of living was gone. "Roman Lamps, Scupi - Eastern Necropolis 1st - 2nd century A.D. ceramics"
With archeological researches has been started in the period of before the world war and more intensive in 1966. It has been discovered that on 40 hectares land by walls with size 738x590 meters is located Scupi. Today there are still archeological researches here. "Glass Cup, Scupi Eastern Necropolis (tomb 125 1st century A. D.)"
Scupi Theater: Lies on the south western part of Zajcev Rid. It has a scene long 98 meters and dimensions 98x15. Belongs of the Roman type of theatres and dates from the second century in the time of Hadrian. Researches made in 1928, 1935-1937, 1959-1960. "Stomna (water vessel) Eastern Necropolis (4th century A. D.)"
Scupi Civil Basilica: is located in the southern part of Scupi. It is with mosaic with geometric forms and ornaments. It is dating from the early 4th century. Researches made in 1975-1979. 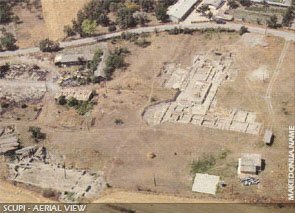 Scupi Christian Basilica: located southwestern from the theatre. It has apsida on the eastern side and bapsterium on the western side. Dating from the end of the 5th and beginning of 6th century. Researches made in 1975-1979. Scupi Grand Palace: lies deeply under the Christian basilica. There are founded some fresco decorated walls and small termic part. Dating from the early 4th century. Researches made in 1973. Scupi Thermi (Baths): located in the central town part. They have simple plan of construction and dating from 4th century. Researches made in 1983-1989. Street: one of the most important communications in the town with orientation northeast-southwest, as all complexes in Scupi. It has size of 8,50 meters and made of big stone blocks. Dating after 286 year. Researches made in 1976 and again in 1980-1989. "Tombstone - marble 1st - 2nd century A. D. Scupi"
Scupi Necropolis: located outside the town. Scupi Western Necropolis: located by the west part of the town. It is necropolis from different periods. Roman and younger unknown period. Researches made in 1990-1994. Eastern Necropolis: founded around 300 graves from Roman and late ancient time. Researches made in 1970-1971 and in 1973.